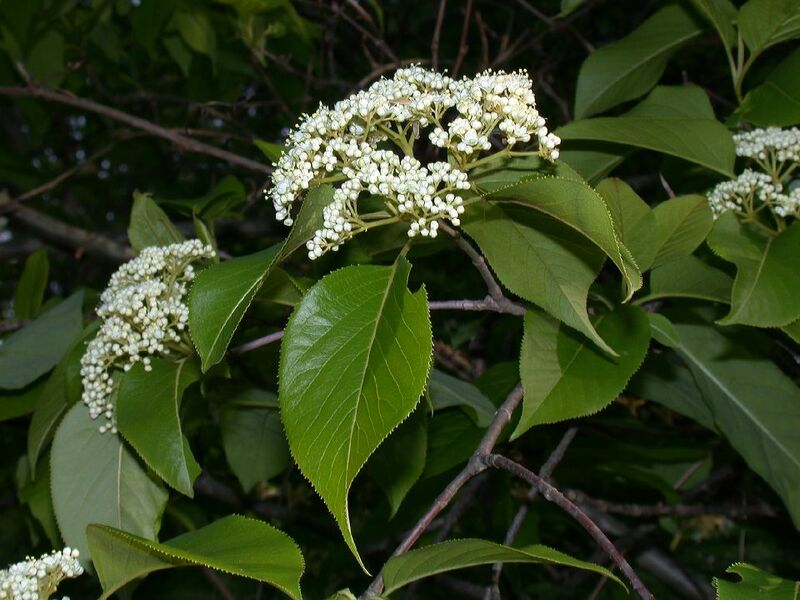 Viburnum lentago.Kevin C. Nixon.plantsystematics.org (Accessed 6/2014). Viburnum lentago is a shrub to 10 m. tall, mostly hairless, stems gray-brown with fine, raised lenticels, new shoots gray-green; terminal winter buds dull, finely scaly, gray-pink to dark gray-brown, 1-2 cm long, leaf buds about 0.4-0.6 cm long, narrowly lance-shaped, with two opposite scales that do not overlap; leaf scars U-shaped. Leaves opposite, stalks to 2 cm long with irregularly winged margin (lumpy), blade egg-shaped, oblong, to rounded, to 8 cm long, 4 cm wide, tip sharply pointed, base blunt, shiny, dark green above, margin sharply toothed, teeth often incurved; leaves expanded early May; winter plant leafless 140 days (Britton 1874); flower buds ca 2.5 cm, bulging near base, tip long-pointed, base tapered, inflorescence umbrella-shaped, 5-10 cm wide, unstalked, 3-5 major branches from twig tip. Flowers white to 0.8 cm wide, petal lobes pointed, blooms mid-May (Britton 1874). 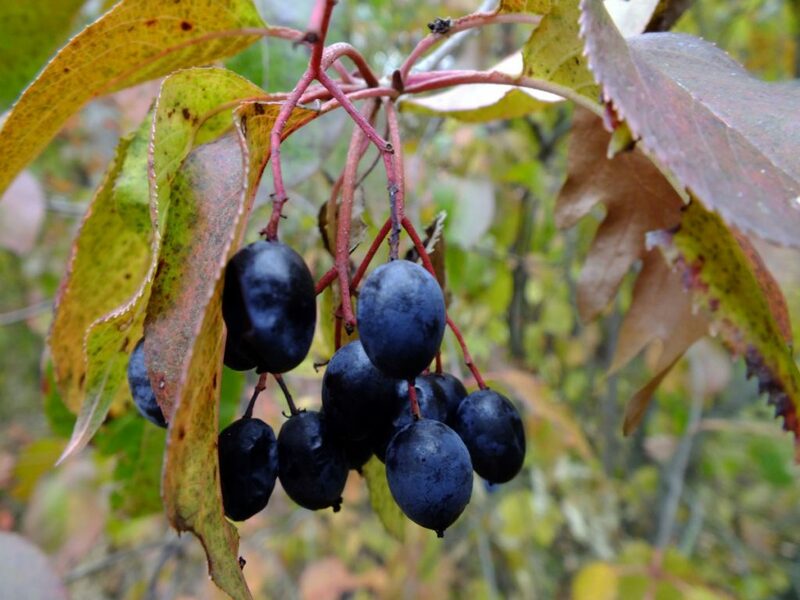 Fruit fleshy, to 1.5 cm, blue-black, with whitish bloom, sweet, 1 flat seed. Fruit eaten by migrating songbirds, game birds and mammals, including bear, raccoons, foxes and skunks (Wilson 1993). Frequency in NYC: Infrequent, sometimes from plantings. Habitat: Open woods, edges, rich, moist soil pH 5-8.5 (USDA, NRCS 2010). Tolerant of drought. Moderately tolerant of shade, index 5-6. Tolerant of flooding or saturated soil up to 25% of growing season. Intolerant of salt, soil compaction (Hightshoe 1988). Notes: Under some circumstances, nanny-berry may form dense stands in successional habitats that persist for decades. Colonies slowly open as central stems senesce, allowing growth of understory herbs and tree seedlings that eventually overtop the shrub canopy (Niering et al. 1986). Twigs browsed by rabbits, deer, squirrels (Martin et al. 1951).